The pull-down spray wand comes free with a gentle tug and gives you total flexibility. The hose extends and retracts without friction points, fed by gravity. As you raise the wand to dock it, the magnet embedded in the spout pulls the wand precisely into place. So, unlike other pull-downs that tend to droop over time, MagnaTite<sup></sup> keeps your pull-down faucet looking picture-perfect. A toggle on a Multi-Flow wand increases the stream from the standard 1.5GPM to a higher flow to more quickly fill the sink as well as pots, vases, or other large containers. Toggle back to 1.5 GPM for normal, everyday use. The innovative Multi-Flow feature can be found on a variety of Delta kitchen faucets. Delta's exclusive DIAMOND Seal<sup></sup> Technology uses a valve with a tough diamond coating. InnoFlex<sup></sup> PEX waterways keep water inside the faucet out of contact with potential metal contaminants. This powerful combination brings you a faucet built to last up to five million uses. The Dominic Single-Handle Pull-Down Kitchen Faucet beautifully combines aesthetics and technology. With Touch2O Technology, it doesn't matter if you have two full hands or ten messy fingers. Tap anywhere on the spout or handle of the faucet with your hand, wrist or forearm to start and stop the flow of water. SpotShield Technology helps defend your faucet against spots, germs and stains. Delta's exclusive DIAMOND<sup></sup> Seal Technology ensures you faucet is leak-free and worry-free for the life of the faucet. The Esque Kitchen Collection's refined curves and cosmopolitan contours give it a clean, poised look that accentuates the fresh modernity of a contemporary kitchen or complements the tranquility of a transitional space. Delta ShieldSpray Technology cleans with laser-like precision while containing mess and splatter. A concentrated jet powers away stubborn messes while an innovative shield of water contains splatter and clears off the mess, so you can spend less time soaking, scrubbing and shirt swapping. Delta MagnaTite Docking uses a powerful integrated magnet to pull your faucet spray wand precisely into place and hold it there so it stays docked when not in use. Delta faucets with Diamond Seal Technology perform like new for life with a patented design which reduces leak points, is less hassle to install and lasts twice as long as the industry standard. Fuse Single Handle Pull-Down Kitchen Faucet, Stainless and Snowflake White The pull-down spray wand comes free with a gentle tug and gives you total flexibility. The hose extends and retracts without friction points, fed by gravity. As you raise the wand to dock it, the magnet embedded in the spout pulls the wand precisely into place. So, unlike other pull-downs that tend to droop over time, MagnaTite<sup></sup> keeps your pull-down faucet looking picture-perfect. A toggle on a Multi-Flow wand increases the stream from the standard 1.5GPM to a higher flow to more quickly fill the sink as well as pots, vases, or other large containers. Toggle back to 1.5 GPM for normal, everyday use. The innovative Multi-Flow feature can be found on a variety of Delta kitchen faucets. Delta's exclusive DIAMOND Seal<sup></sup> Technology uses a valve with a tough diamond coating. InnoFlex<sup></sup> PEX waterways keep water inside the faucet out of contact with potential metal contaminants. This powerful combination brings you a faucet built to last up to five million uses. 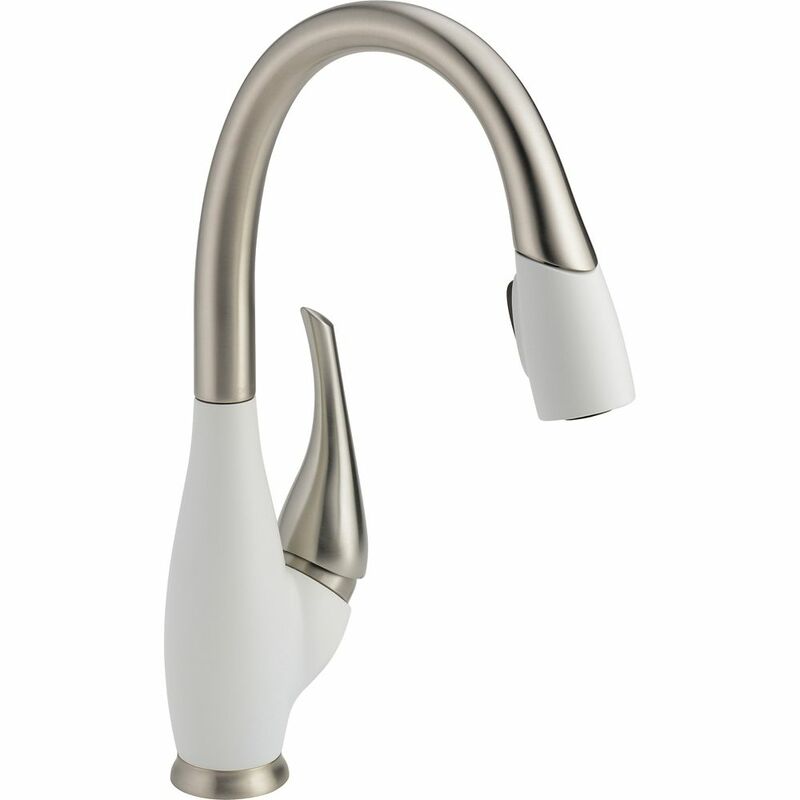 Fuse Single Handle Pull-Down Kitchen Faucet, Stainless and Snowflake White is rated 4.6 out of 5 by 80. Rated 5 out of 5 by Cyn from This kitchen faucet is both artistic and functional! It... This kitchen faucet is both artistic and functional! It was installed easily and efficiently with everyone enjoying using it. I’m so happy with my choice!!! Rated 5 out of 5 by missouri92 from Best Ever I am totally not into fussy Stainless at all, so this faucet just fit my needs. I moved into a new home and the prior owner went Stainless nuts in the kitchen. I purchased a new stove mixing 50/50 black and stainless and with the new counters and this faucet the kitchen looks like a million. The faucet performs beautifully. The hose extends very easily and retracts quietly. The spray of water is a little wild. I have deep well sinks and the counter gets wet from the spays. Rated 4 out of 5 by Katie from Contractor said easy to install. Works very well, does not leak, and has great pressure. It also ... Contractor said easy to install. Works very well, does not leak, and has great pressure. It also stays looking beautiful, and does not show finger prints or water spots at all. My only complaint, which isn't a bad one, is that the water temperature adjustment is very sensitive. Rated 1 out of 5 by Mehta from I would never ever buy this faucet again. Its design is so complicated that even professional plu... I would never ever buy this faucet again. Its design is so complicated that even professional plumbers have difficulties in installing it, not only that but uninstalling is also problematic. Moreover, it didn't last even two years. If you want to save a lot of grief, do not even touch this thing with a ten feet pole. Please stay away from it.